A fantastic second-quarter report sent shares skyrocketing. The secret sauce? Focus on people, not numbers. 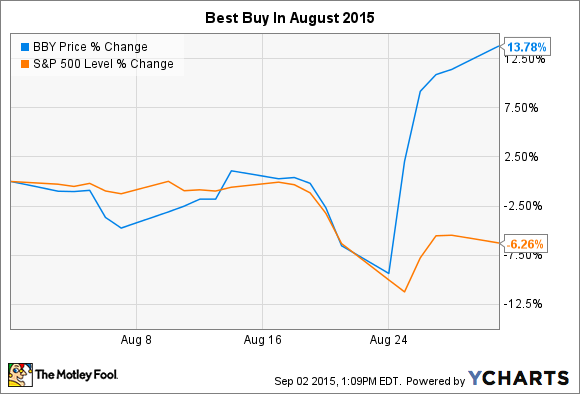 What: Shares of Best Buy (NYSE:BBY) rose 13.8% in August, according to data from S&P Capital IQ. The technology retailer bucked the market's declining trend by posting a strong second-quarter report on Aug. 25, followed by a plethora of analyst upgrades. So what: For the second quarter, analysts expected Best Buy to post earnings of roughly $0.34 per share on roughly $8.3 billion in top-line sales. Instead, the company presented adjusted earnings of $0.49 per diluted share, culled from revenues of $8.5 billion. Sales shrank by 4% year over year, but earnings per share rose 11%. Even Best Buy CEO Hubert Joly called these results "better-than-expected." Now what: The quarter's surprisingly healthy sales rested on large-screen TV sets, major appliances, and mobile phones. These are big-ticket items with respectable profit margins, and exactly the right kind of growth segments if you want to drive higher profits. Tablet sales declined, if you're looking for a downside. Then again, the tablet boom has been fading industrywide for several quarters now. That's hardly Best Buy's fault. Moreover, Best Buy's online sales increased 17% year over year and now represent 8.6% of the company's overall revenues. Best Buy has adjusted its supply chain to funnel more inventory into the online channel. "Our associates are such a formidable weapon for us," Joly said in an earnings call with analysts. "Even though we've taken $1 billion of cost out, we've actually increased the amount of customer-facing labor. We've increased the product knowledge, the engagements, and the overall sales proficiency." And the in-store sales have responded to Best Buy's focus on experienced, high-quality staff. This company will not go down in cost-cutting flames, the way Circuit City did.